Barack Obama and Mitt Romney are heading into the final two days of campaigning with the outcome still too close to call. Republican Mitt Romney will campaign in Iowa, Ohio, Pennsylvania and Virginia, while Barack Obama heads for New Hampshire, Florida, Ohio and Colorado. Both candidates addressed large rallies on Saturday in key swing states. The latest ABC News/Washington Post survey suggests the pair are level with 48% of support. 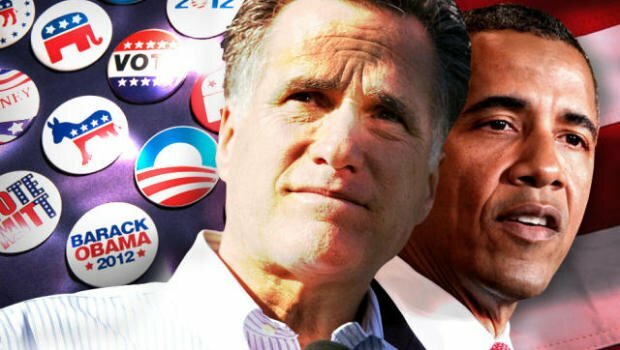 Both Barack Obama and Mitt Romney are showing signs of exhaustion as they continue their daily, multiple-state visits to attract any undecided voters in the marginal battleground states that will determine the winner. Former President Bill Clinton was also suffering as he joined Barack Obama in Virginia, addressing the rally in hoarse tones, saying he had “given my voice in the service of my president”. Barack Obama told the 24,000 people in Bristow, Virginia, that the planning and organization of his campaign now no longer mattered. At Barack Obama’s rally in Milwaukee, pop star Katy Perry, wearing a dress emblazoned with the Democratic slogan “Forward”, helped warm up a 20,000 crowd. Barack Obama told them not to allow Mitt Romney to return the US to a time when Wall St had “free rein to do whatever” it liked. Campaigning in New Hampshire on Saturday, Mitt Romney criticized Barack Obama for saying that voting would be their “best revenge” on the Republicans. Later, in Colorado Springs, the Republican challenger told supporters that Tuesday’s election would be “a moment to look into the future, and imagine what we can do to put the past four years behind us”. “We’re that close right now,” he said. The campaigning there has been at its fiercest. No Republican has ever been elected president without first winning Ohio. But when there has been so much pressure on people to vote early and when all but a tiny fraction of likely voters have made up their mind, how much difference will all this frantic last-minute campaigning have? An opinion poll on Sunday for ABC News and the Washington Post put the two candidates at 48%, with even voters who term themselves independents split evenly on 46%. Mitt Romney remains favored in the whites, seniors and evangelical groups; Barack Obama in women, non-whites and young adults. Barack Obama remains slightly ahead in most of the nine-or-so swing states that will determine the election. Opinion polls published on Saturday showed him well-placed in Iowa, Nevada and Ohio, but most remain within the polls’ own margins of error. The election is run using an electoral college. Each state is given a number of votes based on its population. The candidate who wins 270 electoral college votes becomes president.